Perhaps the most underrated of the first phase of Avengers movies, 2011’s Captain America: The First Avenger was an expertly-crafted origin story that packed a ton of heart into its decidedly old-school framework (it’s retro stylings, largely motivated by the WWII setting, evoked director Joe Johnston’s previously underrated The Rocketeer). Arriving late in a typically superhero-packed summer movie season, it performed well but didn’t seem to generate much excitement. All that changed with the gargantuan success of The Avengers the following year. 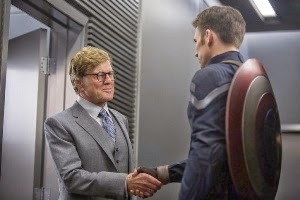 Though few would argue that Steve Rogers (Chris Evans) stole the lion’s share of scenes in that all-star teaming, he helped anchor the story with his unwavering integrity in the face of perceiving shady doings by S.H.I.E.L.D. (Rodgers takes a memorably direct route to uncovering secrets held by Nick Fury). So, following Thor’s successful post-Avengers outing in The Dark World, we have Captain America: The Winter Soldier. 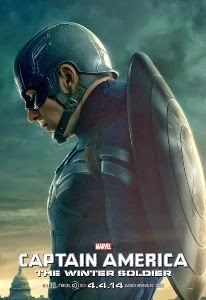 Cap is still adjusting to 21st century life after being unfrozen some 70 years after his “death” in the first film. He even keeps a list of pop culture touchstones he needs to catch up on (Star Wars is checked off, but he’s way behind on everything else). 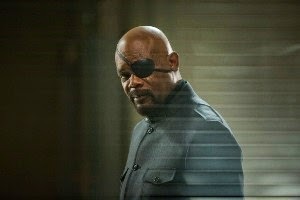 But S.H.I.E.L.D., with whom he is working in D.C., is still exhibiting signs of ethical ambiguity under the direction of Nick Fury (Samuel L. Jackson). The Winter Soldier is essentially a twist-laden political thriller. Corruption deep within S.H.I.E.L.D. threatens to destabilize, well, the entire global population. Familiar “trust no one” territory manages to keep the new film rooted in old-school traditions (think the ‘70s this time, rather than the first film’s ‘40s). In a neat meta touch (given his filmography), screen legend Robert Redford is on hand as a high-ranking S.H.I.E.L.D. officer Alexander Pierce. Pierce is at the heart of the controversial Project Insight. After the opening thwarting of pirates, who were holding hostages on a ship in the middle of the Indian Ocean, Rogers discovers that Natasha Romanoff (Scarlett Johansson, promoted to a lead role after her fine supporting turns in Iron Man 2 and The Avengers) was carrying out orders separate to his. Fury explains the virtues of “compartmentalization,” while revealing S.H.I.E.L.D.’s plans to instigate a massive pre-emptive threat elimination utilizing a set of gigantic Helicarriers in conjunction with satellite tech. Rogers is uncomfortable with this “peace via mass death” approach and determines to uncover the deeply held secrets within S.H.I.E.L.D. In fact, he’s virtually unable to avoid direct involvement after Fury turns up, badly injured, at his apartment. In one of Winter Soldier’s most thrilling set pieces, Fury’s heavily armored vehicle is assaulted on a city street in broad daylight by enemies posing as police, culminating in a fearsome encounter with the mysterious titular character. Joining Rogers in his fight to uncover the truth is fellow veteran Sam Wilson (Anthony Mackie), who begins the film as a PTSD counselor and finishes as the Falcon (significant in comic book history as the first black superhero). As with Thor: The Dark World, The Winter Soldier very ably doubles as a sequel to both the first Captain movie as well as The Avengers. It would be highly unfair to reveal the links to the former, but the latter’s connections are more obvious. 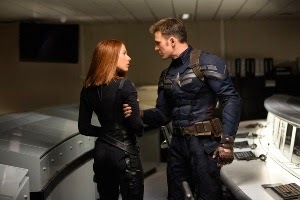 Johansson betters her previous turns as Black Widow with a discreetly funny turn that teases the idea of a romance between she and Cap. Jackson factors more heavily in the action than he did in The Avengers; he looks slimmer and carries more world-weary gravity (and look close for a killer Easter egg referring to one of Jackson’s signature roles). Cobie Smulders is also back as S.H.I.E.L.D. 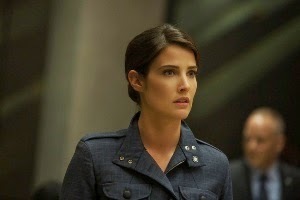 agent Maria Hill. Nine films into the Marvel Studios run of Avengers cycle, Captain America: The Winter Soldier demonstrates that inspiration continues to run high. As with Thor: The Dark World, the plot is thick enough to reward repeat viewings. Though the Helicarrier-based climax can’t help but recall The Avengers, co-directors Anthony and Joe Russo still manage to give the film its own, distinct tone. Chris Evans remains likeable in the role, but aside from the Rip Van Winkle elements of a man awaking completely out of time (an element that is arguably underplayed here, if anything), he’s not given much of a character to play this time. That said, much like Chris Hemsworth’s Thor in The Dark World, Evans is really still part of an ensemble. Returning characters, plus the inspired casting of Robert Redford and Anthony Mackie’s great turn as Falcon, help make The Winter Soldier another Marvel winner. Note: As with The Avengers and Thor: The Dark World, The Winter Soldier has a mid-credits bonus scene and a post-credits bonus scene – both are well worth sticking around for!